Of the Kitten Kind: Breakfast. You are probably getting sick of the sight of this table. I love it. Gordy bought it home from Trent's house when he was helping move some furniture around. It was then that I realised that we are real life Wombles. I looked around at every bit of furniture that we own (other than my desk) and realised that we have been given every bit of furniture that we own. The couches, the coffee tables, the chest of draws, the bed. I hear that the Wombles are being remade. I'm very excited. We need more talk about recycling, always. 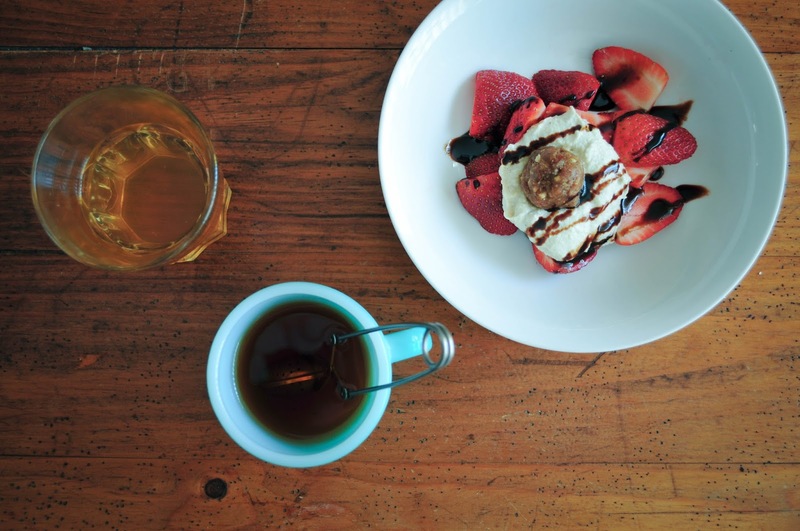 This breakfast is made up of kombucha, black tea, strawberries with cashew cream, a date, pecan and buckwheat ball and balsamic vinegar glaze. I was craving that glaze and it was like magic in my mouth. It's the first day of Spring. All my favourite flowers are budding. I'm feeling the energy of the sun and the earth and I'm loving being alive. It is allegedly approaching autumn here, but I am in denial. Wow, what a gourmet breakfast! I hadn't heard about the Wombles being remade, how cool is that!